Wedding days are special days. We are here to make sure you and your wedding party looked groomed and gorgeous for you and your wedding party. So when you are planning your wedding day hair, here are some important tips and reminders. 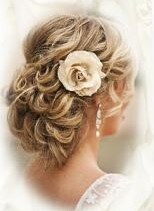 It is best to plan your Wedding Hair at least 6 months before the wedding. Make your stylist aware that you are planning to get married and he/she will be able to advise you when you should start making consultation appointments. Have a look through Bridal & Hair magazines or search on the internet to see if there is a particular style you would like. It is important to have a style in mind and also what kind of head dress / hair accessories you are thinking of using. Book a consultation with your stylist. This is time for you and your stylist to go through how you would like your hair to look and the type of head dress or hair accessories you would like use. Consider whether your hair is to have any colour / highlighting treatment etc. Will you want your hair cut or trimmed. We recommend that any treatments / hair cuts are carried out two weeks before the wedding. Your stylist will advise you of what needs to be done and when. Remember, if in doubt about anything please feel free to ask. During the consultation we will arrange a suitably convenient time for trial runs to be booked for both the bride and other members of the bridal party. During your trial runs, you may want to consider bringing a camera with you to the salon. If you are trying different hairstyles, you may like to have pictures of each style to enable you to choose which style you prefer. The last trial run will need to include head dress / hair accessories being used. We will provide you with a Wedding Day Plan which will include all stylists and appointment times for the bride and bridal party. It is important to make the stylist know about everyone in the bridal party as there is not always time to fit others in at the last minute. Don’t forget about your parents, they want to look good for the big day also. May vary from salon to salon (per appointment taken). Discounts may be available for wedding parties/packages. Guide price typically from £75.00 per hour (excluding travel expenses). Half day and full day rates available. Prices may vary from salon to salon. Please note Home Visit charges are based on stylist’s time, not per the service undertaken. Some salons offer wedding specialist stylists. Charges will vary on the experience of the stylist and full details are required before we can offer a definite quote in writing. Not all salons are able to offer home visits. Read our top ten beginner's online legacycasino.com which can help you on the ideal path. . Chasing some big Online Casino bucks best usa casinos online - caesarsslots777.net.